Great News! Harmony Hill principal Mark Perry and his dog will be joining on us on Friday to do a story time as well. That makes a full five days of story time from Monday, April 17 through Friday, April 21st. Story Time Starts at 10:30am. Also, don’t forget that ACAP will be here on Tuesday, April 18th from 10:30-12:30 to provide information and pre-registration for their Head Start program. Stop by with your questions. 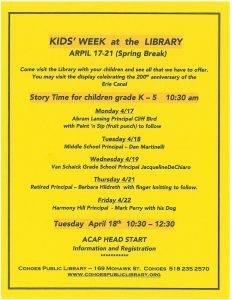 Monday 4/17 at 10:30 am Abram Lansing Principal Cliff Bird (there will be a paint ‘n sip party after Cliff is done reading). Thursday 4/20 at 10:30 am Retired Principal Barbara Hildreth (Barbara will teach a class on finger knitting after the she is done reading).